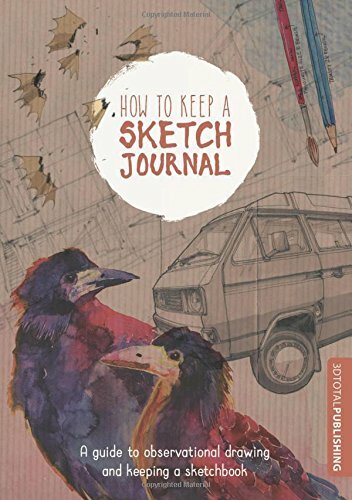 This is a book of tips for those who want to start journaling or keep a sketchbook diary. The book is actually the result of a successful Kickstarter campaign from June 2015. The campaign had other goodies options such as a leather cover and a hardback watercolour journal. This softcover book is designed to look like a sketchbook filled with lots of interesting sketches. It's not a big book, around A5 size, and there are only 112 pages. The book's split into two parts. The first part talks about the different tools you can use for drawing, and the second part features 8 different artists who shares their own sketching tips. I can't believe they actually manage to get Maja Wronska to contribute. She's an amazing watercolour artist and actually the book only talks about the sketching and did not feature her breathtaking watercolour paintings. Overall, it's quite an insightful book. There are lots of useful but brief tips and ideas from the contributing artists. The book's for beginners and you'll get the most out of it if you have basic drawing skills. I like the format of the book. I just wish that they had featured more artists to make the book thicker, which would have made the book more worth the money.